We manufacture and supply distinctively designed Garden Benches used for providing a sitting arrangement in lawns, garden, parks, etc. These Garden Benches are constructed from high-grade materials and appreciated for their high strength, weather resistance and durability. 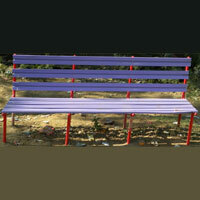 We make available these Garden Benches in different alluring designs and sizes to suit the requirements of the clients.